CLEVELAND, Ohio — Participants and spectators from 46 countries are coming to the Heartland for Gay Games 9, a quadrennial event that for the first time is taking place outside one of the world’s gay capitals. 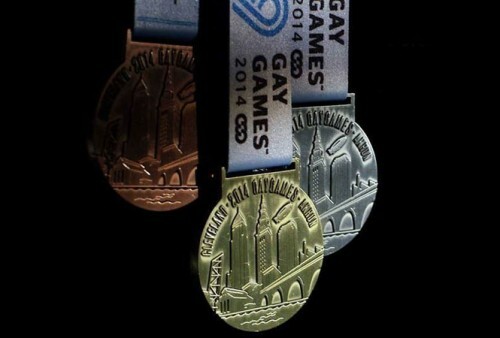 In choosing Cleveland and Akron, organizers said they wanted to stage the Games in a place where they could have an impact in boosting acceptance and support of LGBT people. And although registration for competitors in 36 sports has fallen short of the 10,000 once estimated, the Games’ Ohio hosts say it has lived up to those expectations. The Games start Saturday with an Opening Ceremony at Quicken Loans Arena, hosted by Lance Bass and including Olympics diving legend Greg Louganis, who came out at the Gay Games in 1994. Sports competition begins at 7 a.m. Sunday with the triathlon in Downtown Cleveland’s Voinovich Park and an open-water swimming race at 8a in Lake Erie. By the time the Games conclude on Aug 16 with a Closing Ceremony at the Rock and Roll Hall of Fame, medals will have been handed out in everything from darts to tennis to track and field. There are team competitions in sports such as softball, soccer, flag football and ice hockey. And some competitions can’t resist a bit of gay camp. Swimming concludes with an aqua-drag party called Pink Flamingo. Gay Rodeo, part of the Gay Games for the first time, includes an event called the Wild Drag Race, in which one of each three-person team competes in drag. Off the field, there’s plenty of gay. Entertainers coming to Cleveland and Akron during the week include Bass and Louganis, the Indigo Girls, Boy George, Alex Newell of Glee, Ana Matronic of the Scissor Sisters, comedians Erin Foley and Fortune Feimster, and writer Del Shores. The last three winners of RuPaul’s Drag Race – Bianca Del Rio, Jinkx Monsoon and Sharon Needles – will perform in one show Sunday at Bounce nightclub.